This definitely non-vegetarian dish is a specialty of the Bohra Muslim community in Gujarat. White Gujarat is one of the most vegetarian states in India, it has a substantial Muslim community which follows its own dietary restrictions that do not prohibit beef. Of course, this does not sit well with Hindus, which have criminalized the killing of cows. Needless to say, religious-based violence in Gujarat is a problem. If you are going to risk your life to eat beef, then the recipe for preparing it better be worth it. This recipe is. The marinade not only adds a fresh, vibrant flavor to the beef, but tenderizes it to the point that this simple sirloin felt like filet mignon. It was delicious. Traditionally, the cubes of beef are skewered before frying, but I followed the recipe author's advice and skipped that step. I also didn't really deep fry them (I'm too cheap to use that much oil); instead I used enough oil to cover more than half of each cube and I turned them after two minutes. Combine the beef with the ginger, chili, garlic, cream and salt and let marinate for at least 3 hours. Beat the egg in a bowl and place the bread crumbs in another. 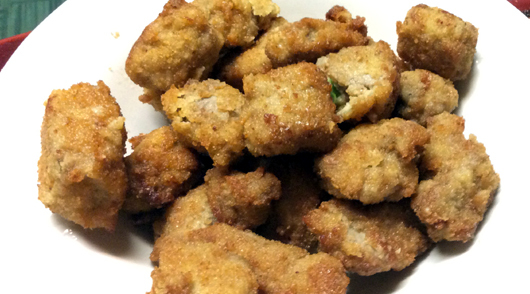 Dip each beef cube in the egg and then roll it in the bread crumbs. Heat enough oil for deep frying over medium heat in a frying pan and carefully add the beef in a single layer. Fry, turning if necessary, until the beef is cooked through, about 4 minutes total. Drain on paper towels and serve. Adapted froma recipe in Madhur Jaffrey's A Taste of India.